Love’s Travel Stops completed the company’s first live customer transaction using RFID cardless fueling technology and Comdata’s financial processing software. In addition to completing a live customer transaction using Comdata, Love’s also used DFConnect for cardless fueling transactions with their fuel tanker fleet for the past year. With more than 290 locations and 140 truck tire care centers in 39 states, Love’s plans to continue to roll out the RFID software at all travel stop locations. 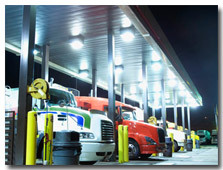 The software and RFID equipment are designed to detect a truck’s RFID tags in the fueling lane and turn on dispensers wirelessly, with little or no driver data input. RFID technology saves time for professional drivers and offers a secure financial transaction. Pumps are automatically turned off by RFID software after a truck leaves the fueling bay, which can reduce fuel theft incidents. More than 100 of Love’s locations will have cardless fueling technology available for professional drivers by the end of August and the entire Love’s network of travel stops will have it available in September.